2017 has been a momentous year, for myself, for my blog, and for our country. However, I try to avoid discussing politics here, so I'll keep the focus of my review of the past year on my own work. I started this blog in late 2014, and have managed to keep it going on a weekly basis for most of the time since then, which is an accomplishment I'm quite proud of. 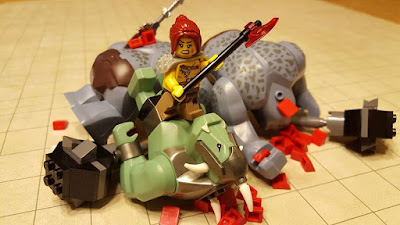 For those new to this blog, I write about roleplaying games, LEGO toys, and how I combine the two, with occasional forays into my other hobbies. I have a number of ongoing series that I add to as I find the time and inspiration. These include session summaries for the campaigns that I Game Master, reviews of RPG and LEGO products, and other subjects. Each item below includes a link to the most recent installment; most of those pages include links to previous columns in that series. "Building the Bestiary" is my series on how I build LEGO miniatures for my tabletop role-playing games. It focuses on the first Pathfinder RPG Bestiary and the D&D 5E Monster Manual. It's my longest-running series here, with 17 installments, and I added an Index this year to help readers quickly find specific monsters I've covered. I also post reviews of the collectible LEGO Minifigures Series once I acquire enough of each new set. I only wrote one such column in 2017 (The LEGO Batman Movie Minifigures), but I anticipate doing one of The Ninjago Movie Minifigures series sometime soon, as well as the upcoming second The LEGO Batman Movie series. "Time of the Tarrasque" is a homebrew Pathfinder campaign that I started in January 2017. This is a world that I've been tinkering with for years (decades, really), so was very pleased for it to see actual play. We are currently on hiatus due to many of our players having changes in jobs and/or residences this fall and winter, but we hope to resume again soon. The heroes have reached 3rd level and I hope to see them advance to 20th level (and possibly some mythic tiers) by the end of the campaign. I am a long-time fan of Green Ronin's Freeport setting. My long-running third Freeport campaign, which ended in 2016, used D&D v.3.5 and later Pathfinder, but I've been considering using D&D 5E for my next foray into that setting. My Freeport 5E articles include reviews of Wizards of the Coasts' "Unearthed Arcana" and Plane Shift articles, Green Ronin's Book of the Righteous, and other 5E titles with an eye to using them with Freeport. I recently acquired Volo's Guide to Monsters and Xanathar's Guide to Everything, so expect columns about them within the next month or two. I am also making an effort to get more experience with Green Ronin's Fantasy AGE system, and have started posting my thoughts on that game.